As fans, it’s always nice to know that our favourite artists are just as cool, vibrant and generous as the beautiful music they make and share. 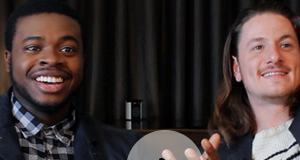 And for us here at ANDPOP, that’s always the impression we get when it comes to the lovely people in Pentatonix. As a whole, the Grammy-winning, Pitch Perfect 2-singing a capella group are never seem to be without a smile on their faces or a warm hug at the ready. They’re also never seem to be short on talent. Take, for example, their beat-boxing mastermind, Kevin “K.O.” Osusola. Outside of Pentatonix, Kevin is a talented, Yale-educated musician who began learning how to play the piano, cello and saxophone at a young age. He performed twice at the famed Carnegie Hall as a soloist on the cello and saxophone, was handpicked by the legendary Quincy Jones to represent him at a jazz festival and was also a featured cellist during Pharrell’s performance of “Happy” at the Grammys earlier this year. During Pentatonix’s last stop in Toronto, ANDPOP’s Simon Mohos recently sat down with Pentatonix’s Kevin “K.O.” Olusola for a quick chat. They talk about Kevin’s new EP, what it was like to win a Grammy and developing his own sound. Kevin was also nice enough to give our hopeless host a lesson in beatboxing and accept our “Guess The Backwards Song” challenge! So, did Simon finally learn how to beat-box? And who won the challenge? You have to hit play to find out!